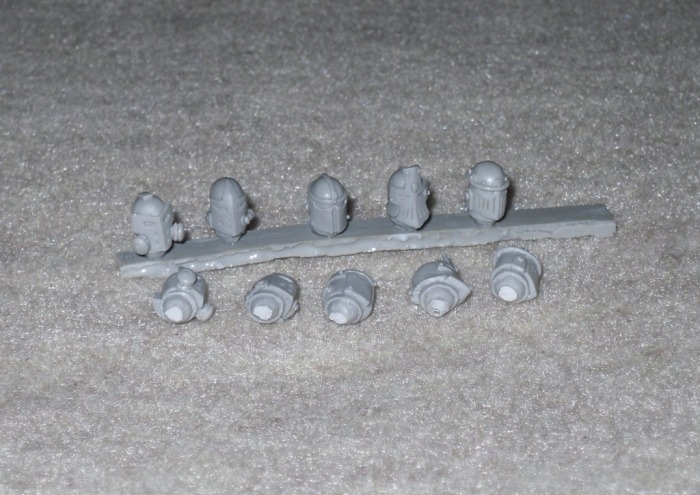 MaxMini started off quite small by offering a few bits in resin, and some plastic mod bit sets, all of which are suited ideally for Warhammer 40k conversions. 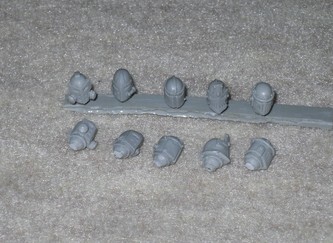 MaxMini's bits are quite popular now, and they offer a nice variety of heads, shields, and weapons, just to name a few. 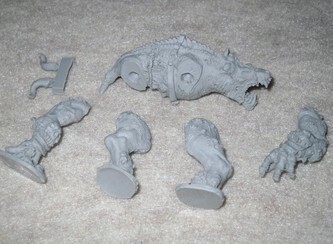 While they still continue to create new conversion bits, they also now produce some of their own complete models. Today I'll run you through an assortment of products that MaxMini sent for review. 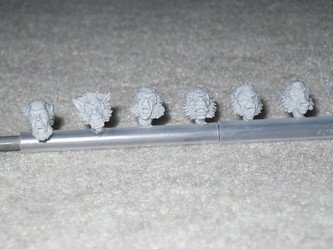 First up is a set of werewolf heads. This set comes with 6 unique head sculpts. They claim these are designed to fit 28mm Heroic Scale models, and they're sculpted by Filin. 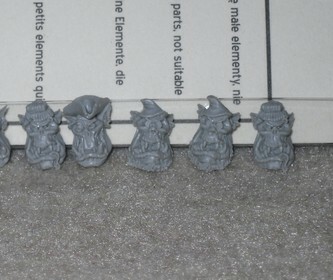 Like most of the MaxMini bits, these too are also cast in high quality resin. A quick inspection revealed no mold lines or flash to remove. Therefore these were ready to go right out of the pack. 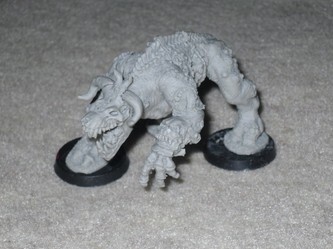 These are ideal for creating Wulfen Space Wolves, or to turn a model into a werewolf I'd imagine, but it's clear these were designed to fill the gap left by Games Workshop no longer offering the 13th Company Wulfen set. 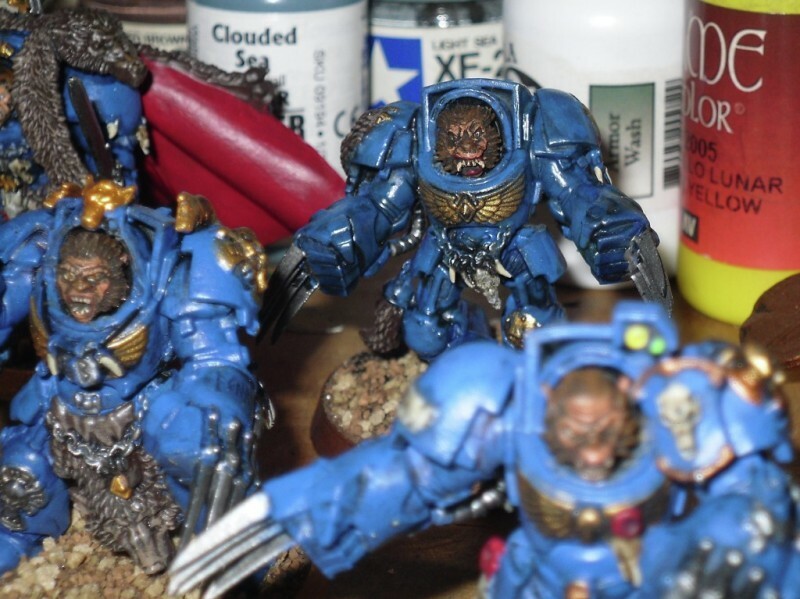 That set is long out of production, and with these heads, and a little green stuff to sculpt some hands into wolf claws, you could easily convert your own Space Wolf models into 13th Company Wulfen. I like that the sculpts are all very unique too. 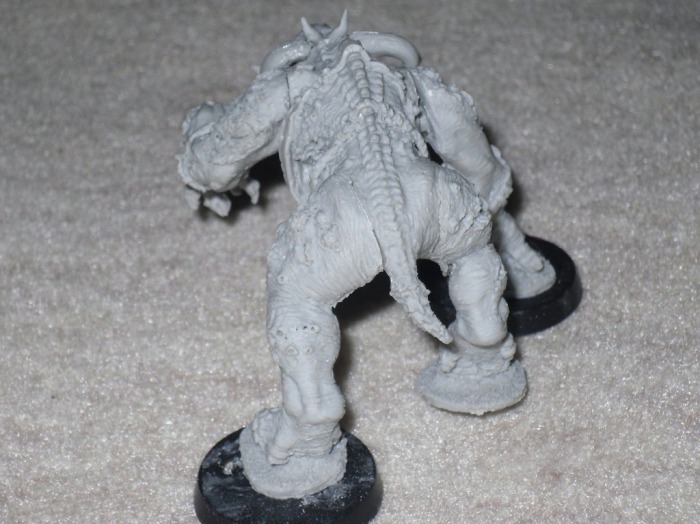 If you look closely, quite a few look like a werewolf in mid-change, which is why I thought they'd make great Wulfen. At 5.65 Euro (=$7.40 USD) for six heads, I think the price could be a little better, but that's a little over $1 USD per head, and it could be a lot worse. They're amazing sculpts, finely detailed, and I'm yet to see anyone else offering heads that could be used for werewolves, or Wulfen. 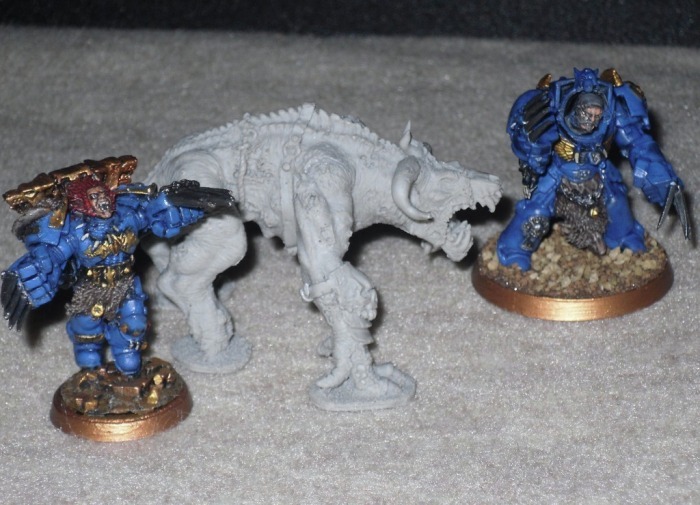 Therefore this set is the best thing going if you want to convert-up your own Wulfen for a Space Wolves army. 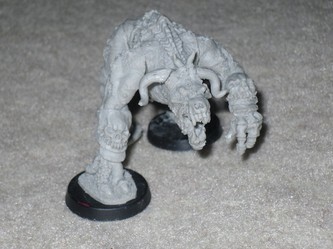 To say The PlagueBeast is an impressive model, is truly an understatement. The level of detail is amazing on this thing. Finely cast in resin, this is a 7-piece model. This thing is like a zombie-beast, as it's decaying and rotting everywhere, and you can even see some of its innards. The head is scary too, as it's partially a skull with some flesh still on it. I don't think the pictures do this thing justice either, it has to be one of the most finely detailed pieces I've seen in a long time. It's rather large too, they claim he's 47mm tall. This model was sculpted by Adam Grabowski. Assembly is the only problem I have with this model. As nice as it is, there are problems with it. First off, it's clear that this is only for a very experienced model builder. I say this, because you will need to utilize green stuff, and it requires repositioning the legs so that this beast can actually stand on its own without toppling over. With just three of the four limbs touching the ground, this design was destined for lack of stability too. While the joints all fit together rather snug, IF I were to assemble it snug, the three legs that touch the ground end up so offset that this thing just won't stand very long without falling over. There's no way to build it and have the three flat pads on each foot end up all laying flat right out of he box, without some work. I had to glue two of the flat pads to 25mm round bases just to take photos, because all it would do is topple over. Even then it was still prone to falling. 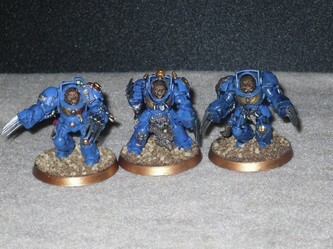 I got lucky and it balanced by itself long enough to take the one picture with the Space Marine models to show scale, but a millisecond later, as soon as I took the photo it toppled over. I also tried to use a 50mm base I had laying around, thinking that might do the trick, but it's too large to fit on a 50mm round base. Even a 60mm base seems too small. Clean up wasn't too bad, as there is minor faint mold lines, and I found maybe two tiny bubbles in the resin in places where it didn't matter much, like where they ended up blending in perfectly with the existing fur details. Visually speaking, I can see this piece making a nice addition to a Chaos Plague Marine army, maybe even a Daemons army in general. At 19.99 Euro this piece ends up in the $26 USD range, which at that price, it's a reasonable deal, because you can't touch a GW model with this kind of detail for under $35 USD or more these days. 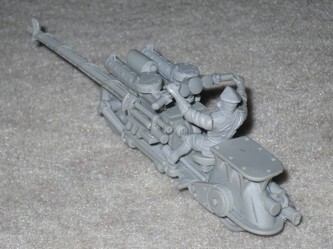 This is more along the lines of Forge World quality sculpt-wise. I bet if this were a FW piece, it would easily cost no less than a $50 dollar bill too. Again this is really an exceptional model, but it's the kind of model which will require extensive modeling work to get the most out of it. This is really a unique contraption. They call it the Steambike. 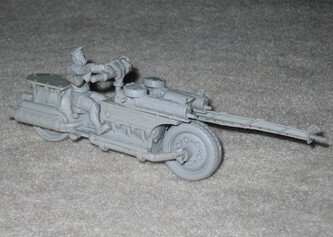 It's a motorcycle essentially, only of a whimsical and steam-punk-like design. This is a 10-piece model, cast in fine resin. Once assembled and road worthy it's a really unique looking bike. I can't say it's like any other motorcycle model I've ever seen before. I really don't know what to think about it, because I can't say that I really like, or dislike it. It's so different, and so unique, that it's definitely not a model everyone will find appealing. 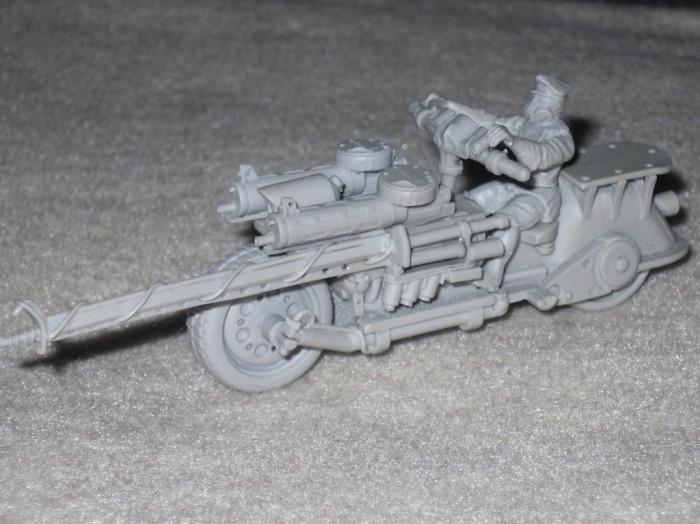 The bike itself was sculpted by Hamster52, and Jaroslaw Smolka sculpted the biker. I don't like the biker much, but thankfully you don't have to use the biker, as you can just as easily assemble the bike without him and use another model to ride it. Clean up wasn't too tough, although there were quite a few mold lines to tend too, and while I didn't find any bubbles in the resin, it did take some filing and cutting to get one of the top guns to mount flush. I also broke one of the front forks trying to mount the front wheel to the frame, because there are no instructions with this model. The way that I thought the model would go together at first glance, wasn't right, and I ended up stressing the parts trying. Therefore I ended up breaking one of the front forks. So I had to glue the one front fork back into place. This isn't a complicated model, because I was able to figure most of it out by looking at the photo at the MaxMini website, but the front wheel placement could use clarification to avoid others from making the mistake I did. It looked like it was to set above and in between the forks at first glance, but later I realized it simply glues to the underside of the forks. I also had some trouble getting the biker to line up properly with the handlebars and seat. 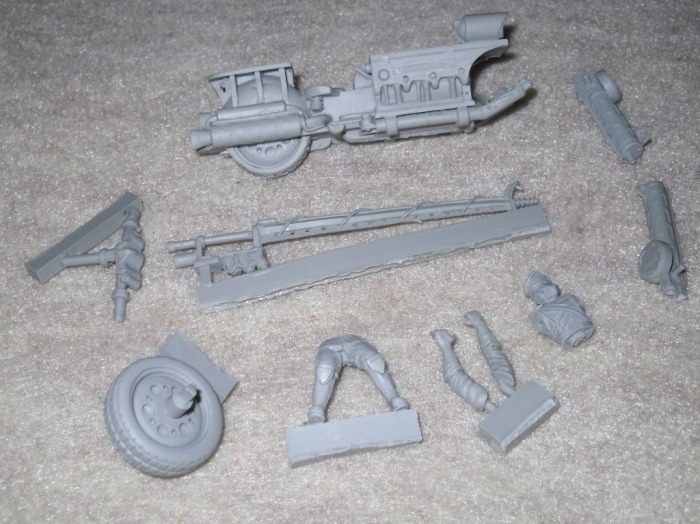 I can't say this is any different than the chaos you deal with when trying to assemble GW's Ork Warbikers. I used to own a dozen or more of those. On more than one occasion I was equally as frustrated trying to line up the Ork upper torso to the lower torso, then trying to make sure the arm was positioned so that when I glued the other arm on it too would reach the handlebars. Tell me, why the hell can't someone just create an upper torso with the arms already on, and already in the right position, or handlebars with the arms already on, so that they fit snug up against an upper torso? Therefore this isn't an issue we haven't seen before elsewhere, it's just a challenge that exists with most any multi-part biker model and bikes. Once all assembled, this is also a tricky piece to get to stand on its own, so if you opt for this model, you might want to pick up a bike-size base for it, as there isn't one included with the model. At 18.00 Euro that puts this model in the $23.00 USD price range, which for an all resin model is quite reasonable. Clearly by design it's not for everyone, but it's not a bad looking model by any means. 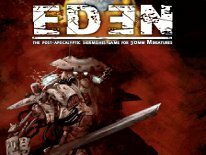 It's just so different, that I can't think of a game system you could really make use of it in, aside from maybe the upcoming Judge Dredd game from Mongoose Publishing, or one of the alternate universe WWII games. 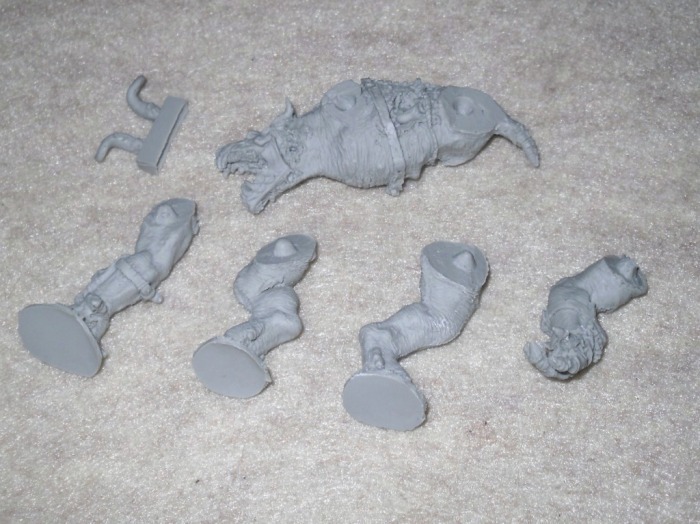 This is a unique conversion bits pack. 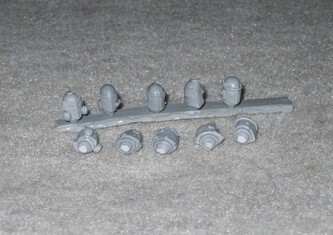 This one comes with 10x 18mm in diameter round shields. Three of these shields have a lion adorning the face, with little cuts on each side of the shield. Three others are completely round with what appears to be an eagle head design on the face, and the final four remaining shields are of an identical design too, with a leafy pattern in a U shape on the face. These are offered at the same price as the werewolf heads at 5.65 Euro ($7.40 USD). Honestly, I just can't fathom paying that much for 10 thin plastic shields. 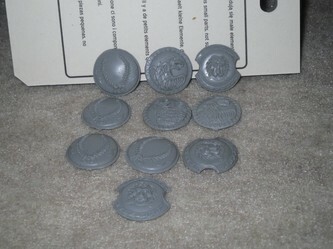 Even as nice as these are, these are plastic, and not cast in resin. I can't see paying more than a $5 bill USD for something like this. 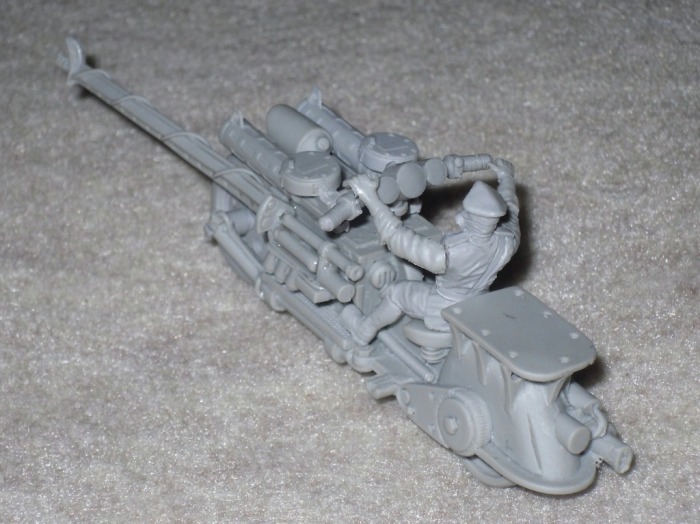 They're designed by Jaroslaw Smolka, and are said to fit most 28mm-33mm heroic scale models. All in all, there's nothing wrong with them, but there's nothing exceptional about them either. I'm a big fan of pirates, and no I don't mean the baseball team. I appreciate the scurvy, “shiver me timbers” sort of pirates. So I was really impressed when I first laid eyes on this Pirate Orc Boys Head set. 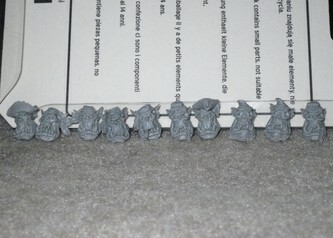 This set comes with 10x pirate heads, which by design are made to fit Games Workshop Orc/k models. 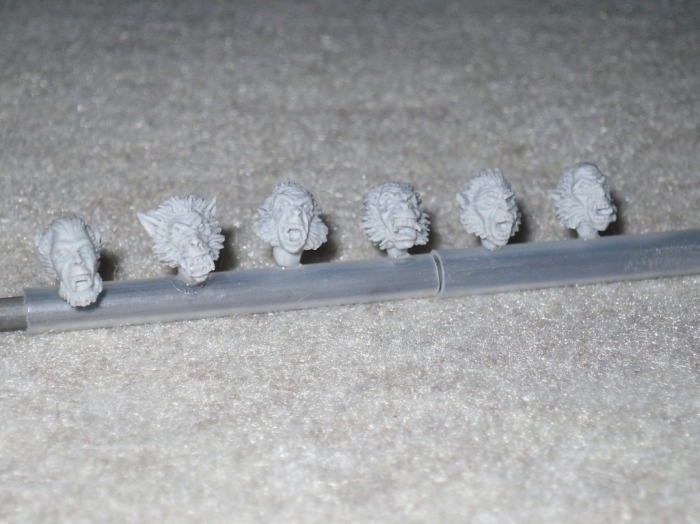 There's a little rounded dip inside the backside of each head, so that they fit perfectly on the nubs on the GW Ork model necks, as if they were an actual GW head. A few have pirate hats, a one has a cigar in his mouth, others are wearing bandannas. They all look ready to live the life of a freebooting scallywag. 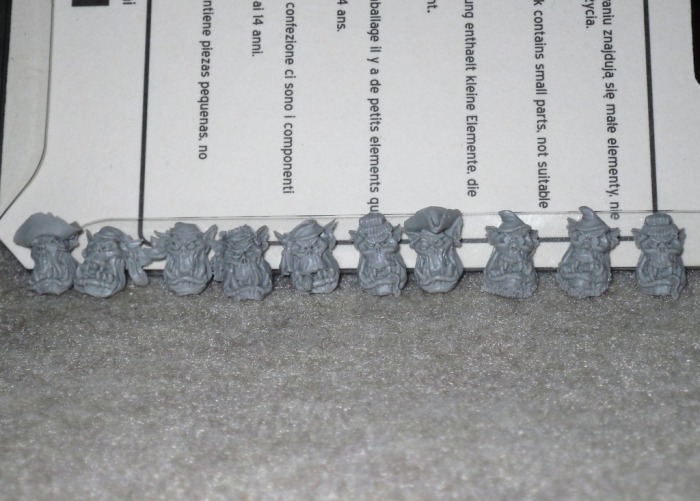 I'm so mad I sold off my 40k Ork army now, but I'm seriously considering getting a few of the WFB Orc models just to use these heads to convert me up some Orcs to use in Freebooter's Fate. At 5.65 Euro ($7.40 USD), this is a set that's worth every penny. 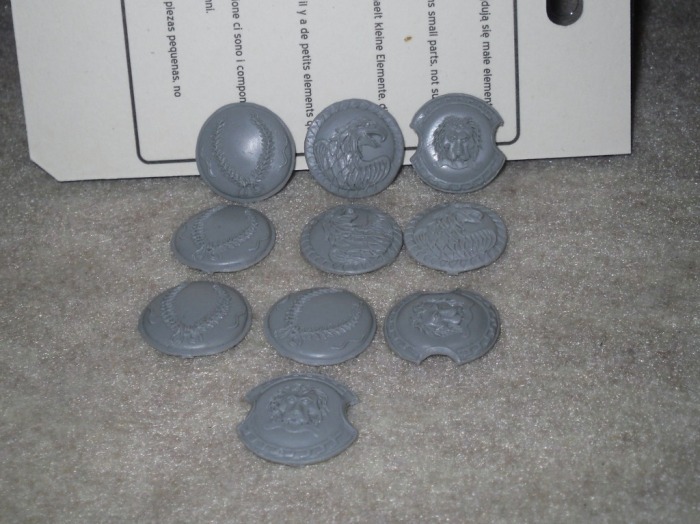 These are also all plastic, and not cast in resin. 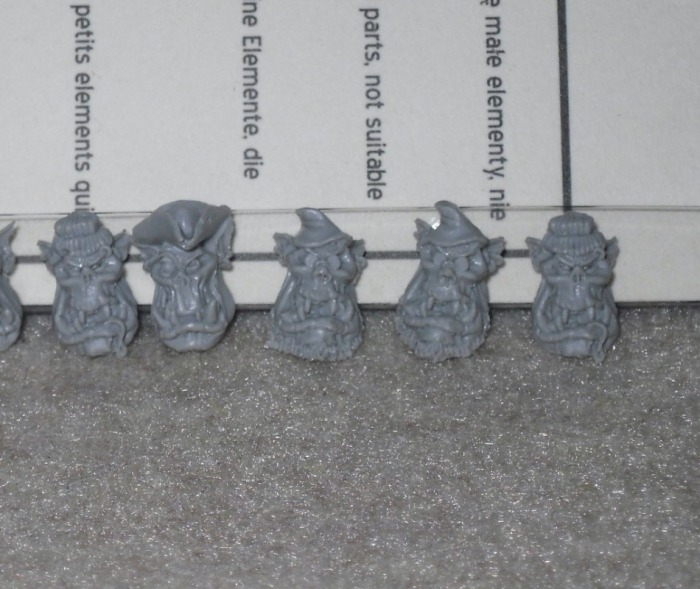 Resin would have been nice, but these plastic heads are every bit as detailed as GW or Privateer Press plastic parts, so I can't complain. 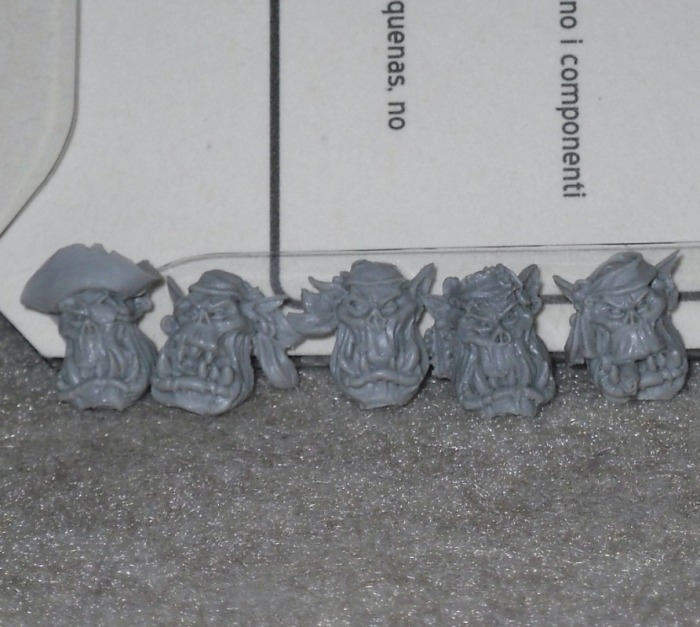 They're extremely nice sculpts, so nice that if you didn't know any better, you might think that GW made Orc Pirates now. This is another set of 10x helmets, only these look like a cross between pre-heresy Space Marine armor, helmets, and Warmachine Warjack heads. I like these. 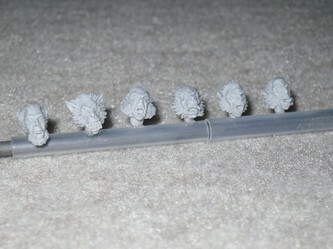 They look like they might make for nice Warmachine conversion heads for maybe Cygnar jacks with a little modification. They'd also look really nice on Space Marine models, and it's clear that these were designed with that in mind. With the recent announcement of Forge World ramping up to sell sets of Mk III Crusade Armored models, these helmets from MaxMini will likely pick up in sales right along with them. Like the other conversion bit sets, these are also priced at 5.65 Euro ($7.40 USD), and there's 2x of each of the five helmet types in the set to be had. These are also cast in resin, and are quite clean pieces altogether. MaxMini clearly does a lot of things right. They just need to concentrate now on creating models that come together a little better than their current offerings. 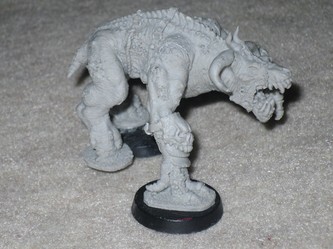 The detail level is unmatched on the Plague Beast, this is a Forge World-quality resin model sculpt-wise, but by design it's not a model that will stand very well on any surface, without some serious conversion modeling work. Even a 60mm size round base is a tough fit for this thing, because I tried one from Micro-Art, and one of the feet still end up off the edge a little. The Steambike is step in the right direction, as it's also a high quality resin model, which comes together rather well for the most part, but the lack of simple instructions is disappointing. They just need to concentrate now on how well the finished product comes together once in the customer's hands. Their conversion bits are also 2nd to none, most of which are resin, but even the plastic bits are superb quality parts. It's clear that the majority of the mod bits are designed to fit GW models, but with a little imagination and modification, nothing says you can't make use of some of this stuff in other game systems just the same. What I covered in this article alone is just the tip of the iceberg. 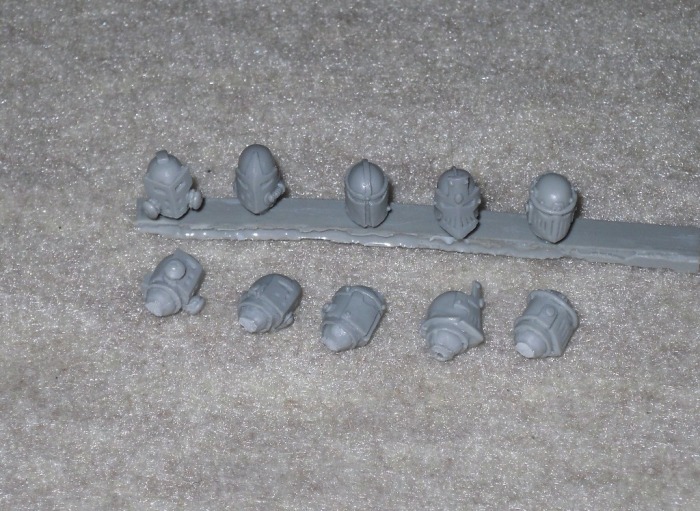 Be sure to check out the MaxMini website to see all of the other bitz and models that they have to offer. The future is bright for MaxMini, because they already have the potential to put out Forge World-quality sculpted models. If they work out the existing kinks with their models, they'll have limitless potential.